In a previous piece we showed that racial resentment, not economic peril, strongly affects support for the Tea Party and views on government spending. 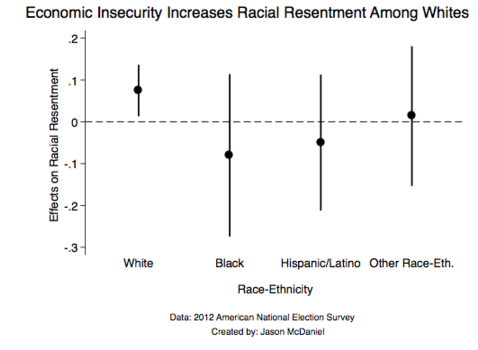 In a separate piece, we showed that racial resentment affects support for government action to reduce economic inequality, while economic peril has very little effect. 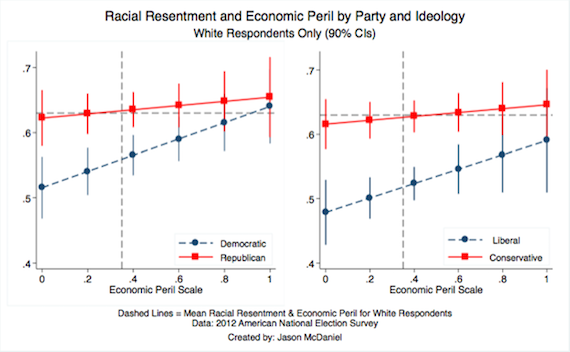 Here, we explore how economic peril affects views of racial resentment and could be driving formerly independent or moderate voters toward Trump. Our analysis uses data from the 2012 American National Election Study, a wide-ranging survey of the political attitudes and behaviors of over 5,000 respondents. To measure feelings of economic insecurity we created a variable scale that combines five questions related to financial well-being -- for example, whether an individual is worried about their finances. Racial resentment attitudes are measured with a scale created from five questions that characterize color-blind racial attitudes (for instance, “If Blacks would only try harder they could be just as well off as whites”). We control for individual race-ethnicity, age, income, gender, geographic region, party identification, ideology, political knowledge, importance of religion, feelings toward illegal immigrants, and overt racial stereotypes. The implications of this finding become clear when we examine the relationship between racial resentment and support for federal spending to aid the poor. 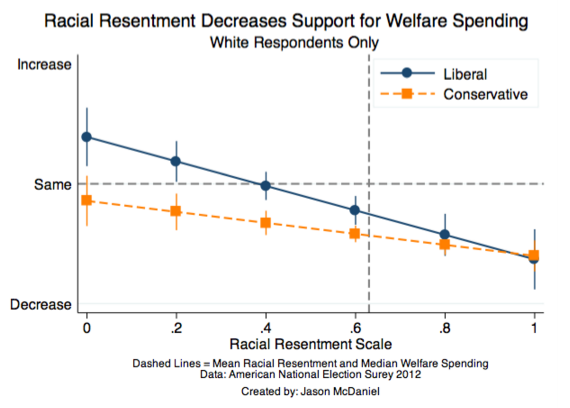 The graph below shows that as resentment increases, white liberals and conservatives begin to have the same preferences on welfare spending. At the highest level of resentment, white liberals and conservatives have the same preferences on welfare. (We find that aid to the poor does not have this relationship, suggesting that welfare is racialized, while aid to the poor is not). Two more models show why this effect is so important. 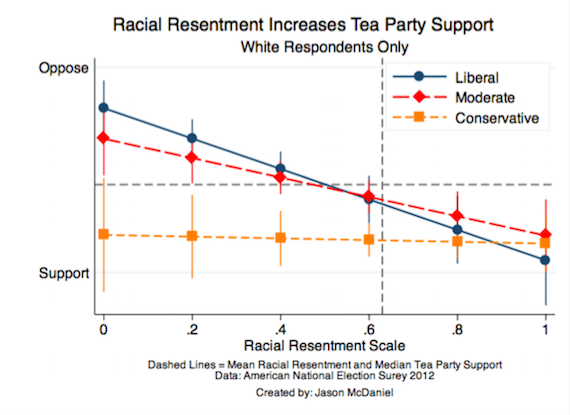 First, as the chart below shows, racial resentment among liberals and moderates strongly predicts Tea Party support. As economic peril (and therefore racial resentment) increases, liberal whites become more supportive of populist right movements. Indeed, at the highest level of racial resentment, white people of all ideologies are virtually identical in terms of Tea Party support, after controlling for other factors. These findings are in line with other research on the subject. A 2004 study of affirmative action in California finds that racial attitudes, not economic anxiety, drove white opposition to affirmative action. Another study, by political scientist Jack Citrin and others, finds that “personal economic circumstances play little role in opinion formation” regarding immigration policy, but rather, they are affected by feelings about Hispanics and Asians. Racial attitudes are exacerbated by extreme political rhetoric, but also by more subtle rhetoric (i.e., “welfare queens”). A study of immigration in North Carolina finds that economic peril increases the sense that racial groups are in competition, leading to higher levels of intolerance. For these reasons, it’s clear that progressives should be wary of arguments that recessions or financial crises lead to opportunities for progressive policymaking. Rather, they foster exactly the sort of divisiveness that strengthens right-wing movements, at least for whites. For all the talk of “the working class” supporting Trump, few pundits have noted that the working class is increasingly diverse. The idea that economic peril alone creates Trump support is belied by the fact that working-class people of color aren’t flocking to Trump. The reason so many liberal and moderate whites are flocking toward Trump is simple: racism. Jason McDaniel is an Assistant Professor of Political Science at San Francisco State University. Follow him on twitter at @ValisJason.